How can you improve pizza and mac & cheese? Combine them! 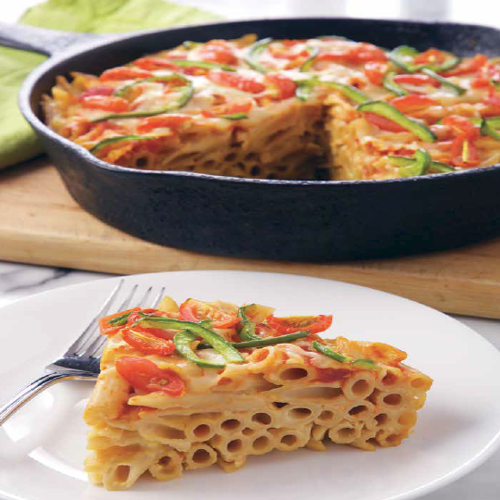 With a little experimentation in the kitchen, Pizza Mac and Cheese Pie was born! A healthier comfort food that everyone will love. Instead of a doughy pizza crust base, I use whole-wheat penne pasta and pour a light cheese sauce over top. The cheese sauce is made with evaporated milk and chicken stock thickened with flour, which eliminates the use of excess butter and higher-fat milk. Using a sharp cheese amps up the flavour and allows you to use less, which also lowers the overall calories and fat. 1. Preheat the oven to 375°F (190°C). Lightly spray a 10-inch ovenproof skillet or pie pan with vegetable oil. 2. In a large pot of boiling water, cook the penne according to the package instructions, just until slightly firm to the bite (al dente). Drain the pasta well and transfer to the prepared pie dish. 3. Make sauce: Meanwhile, in a saucepan over medium heat, whisk together the flour, stock and milk until smooth. Cook, whisking constantly, for about 3 minutes or until the mixture is slightly thickened and heated through. 4. Stir in the cheddar and Parmesan, and the mustard. Cook until the cheese melts, about 1 minute. Remove from the heat. Pour the cheese sauce over the pasta and toss to combine. 5. Using a rubber spatula, flatten the pasta in the pan. Top with the tomato sauce, green peppers, tomatoes and mozzarella cheese. Bake in the preheated oven for 25 minutes, until heated through and cheese is melted and bubbling. Remove from the oven and let rest for at least 5 minutes before cutting into individual portions.